However, there are a ton more great tips and tricks out there. For those, I turned to my trusty online network of military spouses and educators. Here are their top tips! Parents throughout the military are choosing to focus on the fun parts of moving rather than the new school and new friends part. So, instead of trying to make it those “new” things sound awesome, instead talk about the fun things waiting there. For younger kids, it might be easier to help them join new activities. Older kids might need some convincing and “help.” Dropping brochures around the house for summer camps, extracurricular activities, or social groups that seem up their alley might give you an assist in guiding teens toward the fun. Many summer camps offer discounted or free packages for military families. Totally check it out! Moving early in the summer, or even right before school lets out, can help children adjust to their new location AND gives them more time to make friends. By arriving earlier in the PCS timeline, your children will have more time to spend at summer camps or other social activities. The more time they can spend at these low-key, low-pressure activities, the higher their chances are of making new friends. For younger kids, regular summer day camps, church groups, or school-based programs are perfect. For older kids, consider school specific summer camps like school sports camps, summer drama programs, and very local day camps. Moving early can also help with preparing for the next school year. Many fall sports teams have try-outs in late summer. You wouldn’t want to postpone your move and have your child miss these opportunities. On the other hand, arriving in the later part of the PCS window might give your child more time to wrap her head around the move. In between the end of one school year and the start of the other, you could spend valuable time with extended family, road tripping, or just hanging out for as long as possible in your current hometown. Try to gauge your child’s personality and act accordingly. If your kids have opposite needs, try to compromise as much as possible. There is very little that we can control as military families, but we can control (some) of the elements of our kid’s schooling. Before you move, reach out to the spouse network at your new location. Get the gouge on the school system. Yes, some schools ARE better than others for a variety of factors, and you will want to know all about these before you arrive in a district. Use the Military Interstate Children’s Compact Commission to ease the transition between schools. Before school starts, contact the school and your teacher(s) if possible. Give the school all paperwork, including IEPs and vaccinations. Ask for a sit down to talk with the teaching team about your child and provide some background information that might help them during the school year. If you can’t meet face to face, definitely send an email with any information. Trust me, teachers really like to know who their kids are before Day 1. Your child is about to say goodbye to a huge group of important people. A PCS means that they will be separating from best friends, amazing educators, religious leaders, and neighbors. This is hard, and you should acknowledge that! If their school offers a yearbook, definitely consider purchasing one. If this isn’t feasible, create your own! Make a cover page that your child can fill out with relevant details about themselves and add a few blank pages for friends and teachers to sign. If you want, your child could also use this same DIY yearbook to collect signatures and notes from people in your neighborhood or church. Another great idea to save memories, and space, is to create a memory book of their favorite projects, school work, or artwork from the year. Scan the originals and save the images. Upload each image to your favorite photo book retailer and design a book. Your children get to relive the memories, and you get to declutter your life a little bit. 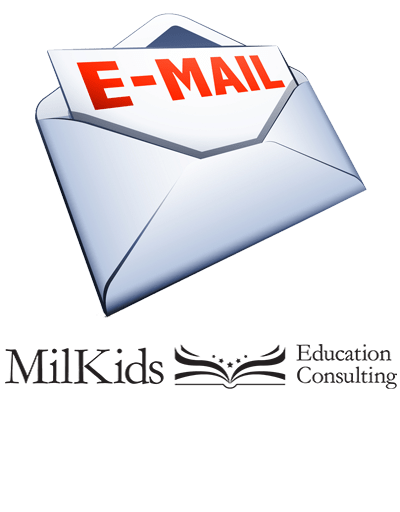 Email accounts are a BIG step for children, but it can be a huge help in keeping our MilKids in touch with their buddies across the miles. For most accounts, you can create a forwarding system to your own email just so that you can monitor who is sending your child messages. Or you could be the keeper of the emails by allowing your child’s friends to contact your own email address. If your children have extremely close friendships, video chatting is a great option. Having once a month Skype or FaceTime dates to catch up on life is a great way to help children maintain their friendships across the world. Or you could go old school and try out pen pals. Your child and his friends can write letters and postcards or send small items from their new hometowns to each other. This is a great way for both kids to learn a little more about a different part of the country or world, and practice letter writing skills, too!